N.B. This article is in 3 sections : "The Good",  "The Bad",  "The Ugly"
Part  :The Good: Logic, Procedure, [Initial] Open Mindedness. I first came across Dr Wood's research via a book:" The 9/11 Conspiracy - The Scamming of America" edited by J. Fetzer. After then reviewing the abundant wealth of information she presented at her excellent website , I became open to the idea that some type of secret military technology may well have destroyed the 2 main WTC towers. As a non-scientist[ unless you wish to include the science of human action-or "praxeology", a social science], I found her early scientific methodology and adherence to principle very refreshing - something she appears to have abandoned to a small degree, at least as far as her research and conclusions about Hurricane Erin's involvement on 9/11 go- which is why I have written these two [overlong] articles dedicated to analyzing Dr Wood's Erin research methodology. However, disregarding her conclusions about Erin, to this day I remain very open to the idea that direct energy weapons [D.E.W.] may well have brought down the 2 towers. Based on my limited knowledge, and given all of the many strange anomalies, her proposal _still_ makes the most sense to date. And regardless, to this day ,her website: http://www.drjudywood.com/ to me has some of the best, most thought provoking photos, research and theories available on the internet. The perpetrators had to be absolutely sure that D.E.W. 's]would do the job . Unlike video fakery, which could be tested and retested until it looked right, the demolition of the 2 towers was to happen in real time and therefor mistakes could not be made. Surely they would have to have done a significant amount of testing somewhere, on something similar to WTC 1 &2, to ensure that the weapon would actually do the job that morning? So where were the tests carried out- and on what? At this time I have no idea, [do you?] but in any case, it is time to move on to part , what I see as " The Bad"[and then finally, in a separate blog, to part "The Ugly"] in Dr Wood's 9/11research. I initially considered Dr Wood's claim that hurricane Erin was directly involved in the events of 9/11 from the viewpoint of a 20 + year inhabitant of the S.E. coast of the U.S..
Hurricanes pass close by almost annually and so one naturally becomes hyper-aware of both the storms themselves, and of the types of natural conditions that are needed to prevent them from endangering my approximate area. So in reviewing Dr Wood's claims, I was very interested to see if she had considered/allowed for the one natural event which both myself and any other experienced hurricane watcher knows will stop a hurricane dead in its tracks, and which will cause a significant change in direction, if not destroy it. [She did not, and has not to date- this is what I call part  :"the Ugly" here below - it comprises the last part of this article]. In the meanwhile,.....back to Part 2. After initially only glancing through Dr Wood's website claims concerning Hurricane Erin's connection to the events of 09/11/01, I came across 2 archived radio interviews at her site [both with Andrew Johnson on Jim Fetzer's "Dynamic duo" show,] which further piqued my interest, inspiring me to go back and take a closer look at the relevant pages on her website [Erin 1 through 10] . "closest to NYC on the morning of 911, around 8am. And then it just stopped, it didn't keep going East, or West, it just stopped and then it turned around and started heading back out"
In those 2 interviews Dr Wood made other, related comments/claims regarding Erin's position and behavior , including claims that Erin's behavior on 911, as revealed by her own graph [ fig 7 at: http://www.drjudywood.com/articles/erin/erin10.html ] revealed classic signs of it being an artificially controlled environment. As you can see,the bottom , blue line above indicates the distance for Erin's eye from NYC, based on NOAA data. The lighter blue points along that line indicate times for those distance readings given in Eastern Daylight Time[ EDT] . Notice how the purple line above the blue plot line gives a 2am EDT reading [although the number"2" has been partly obscured by my image crop], that lines up with the unlabeled light blue plot point on the blue line directly below it, making that blue point below also a 2 am EDT point. Also notice the 2 upward steps in the blue line [look closely now!] between the first unlabeled [2am] light blue plot point and the 8am EDT plot point directly to its right. Notice how this blue plot line continues at an increasing upward angle as it moves to the right of the graph and as Erin's eye continued to move further away from NYC. It seems clear to me that the NOAA data that Dr Wood's has used in her graph[ fig7.] clearly shows [IF you look closely! 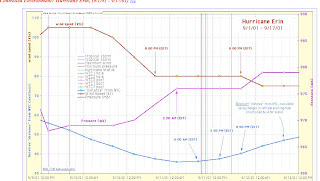 ], that Erin's eye was in fact at its closest to NYC at around 2am EDT on 911, a full 6 hours before Dr Wood claims it that was closest, and that by 8 am EDT it was actually already moving away from NYC in a new, NNE direction. 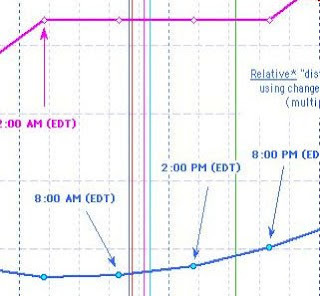 This movement away by 8am can be seen in the graph above taken from her website: http://www.drjudywood.com/articles/erin/erin10.html. A Minor Point- An Insignificant Difference? If you believe that what I show above is an insignificant [ a couple of millimeters ?] difference between the height above the baseline of 2am plot point versus the 8am one, all I can tell you is that it is inevitable that it looks this way, given the format that the data was entered into. The best view for actual position would be shown in a pictorial that plots NOAA data for actual times and positions looking down on Erin's path. I found many, unclear, confusing depictions of such information at Dr Wood's site , most of which are for _predicted_, as opposed to actual path taken. Where actual path was plotted, time and position points often blur/overlap to make then almost useless for close analysis. This is an animated Java plot that, if you are fast with a mouse or trackpad, can be stopped at various time and position points along the route. Sometimes the site does not work properly, you have to fiddle with it a little and click "reload" sometimes to get it to play. This plot also shows Erin to be closest at 2am on the morning of 9/11, at which time it turned to the right, and that it had already moved a significant distance away from NYC by 8am. N.B. "The Ugly"- PART 3 of "Why Dr Judy Wood Is Probably Mistaken About Hurricane Erin and 9/11"- Dr Judy Woods 9/11 Research- The Good , The Bad and the Ugly" follows in the next blog entry.